United by inherent geekiness, Minecraft and Star Trek go together like chocolate and pixelated peanut butter. Even if you've never watched an episode of Star Trek, odds are solid that you can recognize the USS Enterprise. Moreso than any real ship, the Enterprise is iconic. Is it any wonder then that a dedicated Minecraft fan would want to recreate the vessel within Mojang's mega-popular sandbox title? Not at all. What is surprising however, is the crazy amount of detail the builder packed into this creation. While we haven't pored over each detail of the thing for ourselves, its creator claims that this 1:6 replica of the USS Enterprise is almost an exact double for that seen in the Star Trek: The Next Generation television series. It includes everything you'd expect to find there: The holodeck, Picard's quarters, even a blocky Worf. To make sure everything looked as accurate as possible, the ship's creator went to the trouble of building custom textures for the ship, ensuring that as you stroll down its corridors you'll never be distracted by an out of place piece of wall or a computer screen that lacks the trademark Trek futurist aesthetic. Notice that image embedded above? 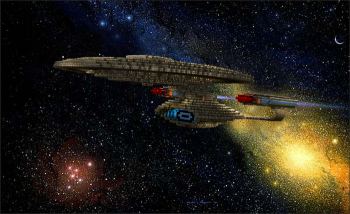 That's the ship itself Photoshopped onto a picture of space. Whether you're a fan or not, that's some very impressive attention to detail, even without Riker's smug beard trying to seduce anything with compatible orifices. Granted, things are a bit more blocky than they were in the original series, but this being Minecraft, that's to be expected. You can find a full gallery of images on Imgur, many of which include the reference pictures from Star Trek: The Next Generation used in the creation of this ship. If you look hard enough, you'll even be able to spot the aforementioned blocky Worf. Isn't he just the cutest?